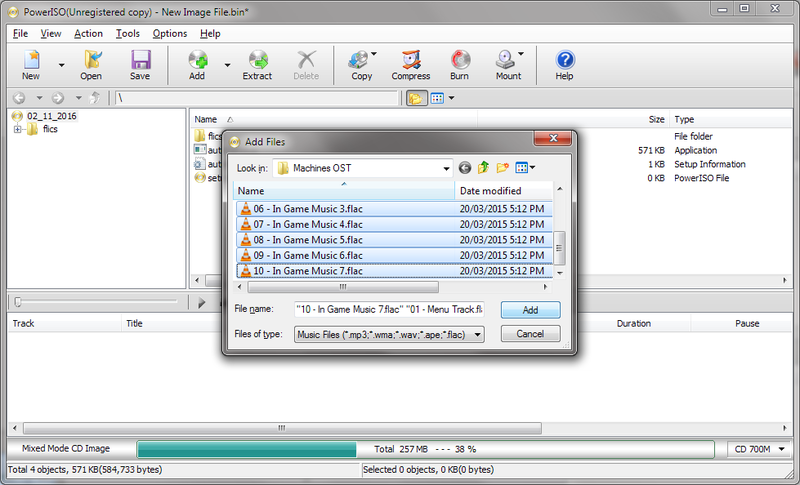 If you burn the Machines soundtrack to an audio CD (or create an audio CD image), the game might play that. Not sure if the track order and timing would be correct. Would probably need the Machines Loader to bypass the disc check. Machines CD 2 would normally have the in-game music on it, but if you're using an ISO image file (like the one available from this site) the music won't be present, as the ISO file format does not support separate audio CD tracks. Unfortunately the in-game music volume control doesn't work on modern versions of Windows (probably due to lack of a CD audio volume control - last time I saw it was Windows XP), so the music tends to drown out some sound effects. @M123 then, even burn a CD with files cd 2 + OST of the game, not work, because even so the volume of the music is bugged on current "windows"? mmm step 2 + OST CD ... okay? because that's what I understood you. sorry my English, I'm from chile, and hopefully is something habeses also have to use the translator. then, even burn a CD with files cd 2 + OST of the game, not work, because even so the volume of the music is bugged on current "windows"? On Windows Vista and newer, Machines will always play music at full volume - which can make some sound effects and voices difficult to hear (even with the SFX volume turned up). I suggest using PowerISO to create the image (unregistered version worked for this despite usually having a 300MB size limit) and Daemon Tools Lite to mount it. PowerISO can be used to write to a CD if desired. 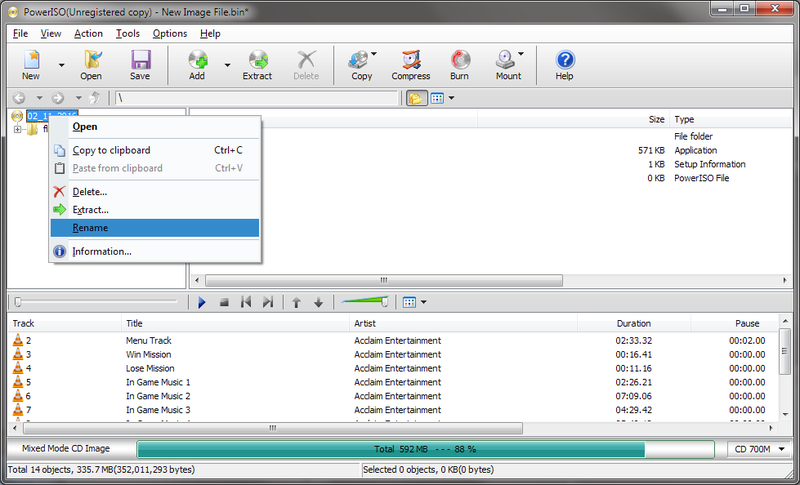 Create a mixed-mode CD image. Add the files from the Machines CD 2 ISO to the data track. Add the OST music files as audio tracks. 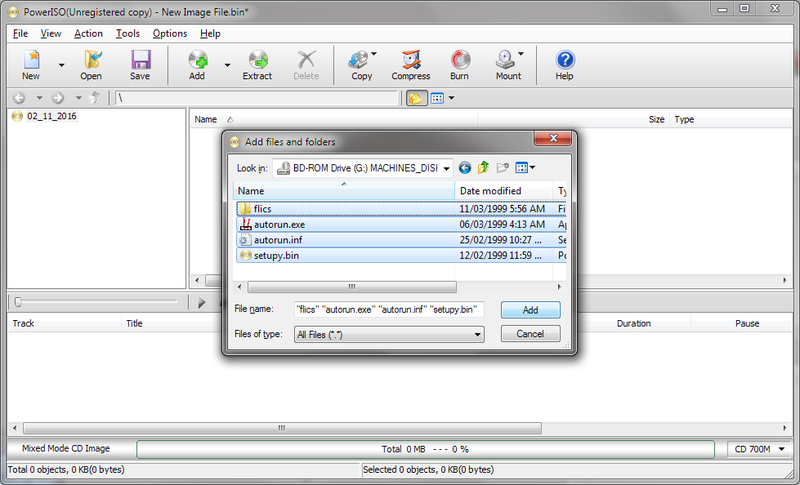 Label the disc image as "MACHINES_DISK_2". At this point you could try burning the image to a CD. 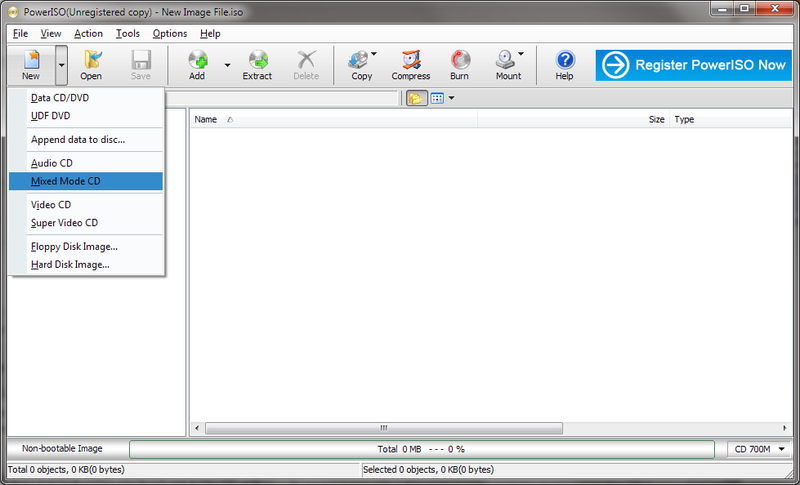 It might actually be easier and more convenient than using it in a virtual drive. Default burning settings in PowerISO seemed to work fine. Mount MACHINES_DISK_2.CUE file (should be in the same folder as MACHINES_DISK_2.BIN). Ensure the virtual drive is assigned a drive letter "before" any existing physical disc drives. If you have a DVD drive assigned "E", the virtual drive needs to be A, B, C or D, otherwise Machines (probably) won't play the music. If you can't select the right drive letter using Daemon Tools Lite, you can use the Windows Disk Management tool to change it separately. I think I did well, now I need to buy a CD because it does not let me put a "virtual reader A, B, C, D, E" leave me alone "F" in adlenate. I hope it works when burning the disc. thanks for that long explanation.